Would you like to improve the performance of your truck? Then it would be prudent to scout around for the best tuners for 6.7 Cummins. The 6.7 Cummins engine is super reliable with its remarkable ability to tow and function quite well even under factory parameters. It is also the largest and most powerful Dodge Ram engine. That’s why it should be accompanied by an even better tuner to boost its functions. A tuner is a little device that is used to optimize engine functions. A good Cummins tuner safely increases horsepower and torque without adding heat. We know that the search for a tuner that can build a high-powered Cummins diesel engine is a frustrating and challenging task that could empty your wallet, and not mention the time you may spend on it. We are here to make your job easier by floating around a few suggestions that you may consider for a 6.7 Cummins tuner. So read up and take notes. Product by RaceMe, a company based in St. Georgen, Austria specializing in making real-time programming tuners. RaceMe Ultra Programmer Pyro Kit is the best starter kit to get your 6.7 diesel engines operating at topnotch standards. It entails a modern design touch screen with gauge monitoring options. The monitor has a customizable user layout with a memory that supports 2007 files and above. It also has a Micro SD slot. You can update the entire system via the internet. You are guaranteed of getting a four-time useable VIN, a Wrap tuning license key and all the power that comes with a RaceMe ultra-tuner. What this means is that now you have the power to tune up to four trucks with only a single tuner. While the first VIN comes unlocked, you still have to purchase the other three unlock codes. Are you tired of always getting this warning messages from you tire pressure, even when there’s nothing wrong? Well, the added TPMS feature gets rid of those warning messages by choosing a different PSI threshold. The software package is just as astounding as it is inclusive of a raised line pressure during shifts and in all forward gears. Additionally, it changes shift points at WOT in all gears standing @ 3000 RPM and improves shift firmness for less clutch slippage. The tuner also offers 6th gear unlock coupled with downshifting to make longer transmissions, avoid massive torque as well as maintaining the line pressure at 225psi. The RaceMe tuner is famous for performing a wide range of functions. It will disable the diesel exhaust fluid, the diesel particulate filter, clear all diagnostic codes and turn the EGR off. It is guaranteed to add 200HP to your engine, and the entire kit comes with an EGT probe sensor that has an accuracy of up to 2200°F. You can count on the RaceMe Ultra tuner to load in just minutes which beats other tuner alternatives by a landslide. The code reader won’t just give you all the diagnostic reports but will also let you clear some warning codes. The codes can also be interpreted in simple non-tech language. 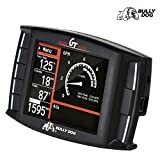 This tuner is also simple to use, improves engine performance and has a light profile which is something you don’t expect from the entire kit. Product by Smarty Performance King. A company dedicated to producing easy to use automotive electronic products. The Smarty Touch Tuner comes with a monitor display that lets you keep an eye on the vitals on your engine. Its gauge brightness, auto dimming feature and customizable background make it stand out against other tuners. This device also features ECM training and horsepower of up to 100. The Smarty Touch is known for clearing diagnostic trouble codes and also allows you to set audible alarms that can alert you when the pyrometer overheats or when the field pressure is too low. An extra feature in the Smart Touch is the specific EGT probe feature which is optional. It will allow you to get the readings of your exhaust gas temperatures. This extra feature from the manufacturer comes at a little more cost, but it’s worth it if you need to see more information when you are driving. The overall benefit of the Smarty Touch is increased horsepower, and you will also get more fuel mileage. The Smart Touch tuner has a fast download time of 1.5 to 6 minutes which is pretty incredible. 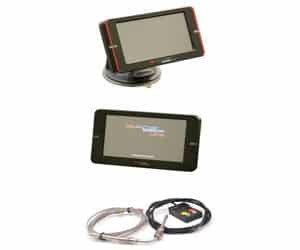 Its large monitor with numerous display functions eliminates the need for using different sets of gauges to get a diagnostic report. The auto-dimming feature comes in handy when you are using it at night if you don’t need all the light shining up in your face. The best part is that you can set alarms that warn you when things are not right with your engine. The alarms are audible but not annoying. Product by Mads Electronics. A dealer in automotive electronics and software with 40 years’ experience in the industry. 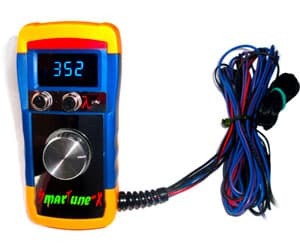 The MADS Smarty Touch is the ultimate advanced programmer for your truck. With its smart tuning feature and in-cab touch screen gauge system, you can now monitor your parameters. It boasts of an astounding range of ten power levels that can increase the horsepower up to 170. You can also get the tuner to improve the vehicle’s fuel economy without making a lot of adjustments. With increased fuel economy, tailpipe emissions are significantly reduced, and consequently, the number of regenerative cycles a car can perform is also reduced. Also, MADS Smarty Touch has a twin CPU design, each carried by the Smarty Touch Controller and the Smarty Touch Display. The twin CPU makes this tuner the fastest display and tuner available that only needs 4 seconds to start-up and the ECM updates in about 1.5-6 minutes. The built-in gauge feature allows you to select four different dashboards with each being configurable with five different gauge layouts plus customizable display backgrounds. The method it uses to gain horsepower entails drawing the most of the power from the bottom and then carrying it to the top with the help of a power band. To sweeten the deal, it also features a user-configurable visual and audible alarms that alert you when you set your parameters at too high or low values. The MADS Smarty Touch Programmer S2G is a great product, and the twin CPU design makes it faster than other tuners. The display is crisp clear and responds effectively with minimal hitches. It is however only compatible with a windows computer, and it’s challenging to get MADS customer support. On the bright side, you will be able to monitor a lot of things that you wouldn’t find with other tuners. Product by Superchips. An industry leader in the best line of performance programmers and tuners suitable for both diesel and gas trucks. 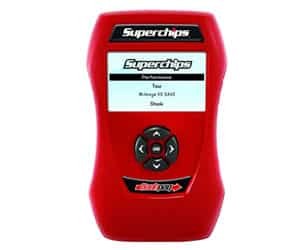 The Superchips Flashpaq tuner is well known for its ergonomic design, innovative technology and performance results. It delivers more power to the wheels than any other tuner in the market. Tire smoking is a standard feature with all Flashpaq makes and models. At the same time, it gets rid of any other problems that may arise in other parts. It contains multiple dyno-proven tunes for fuel economy, maximum performance and towing. Flashpaq is compatible with every low-restriction exhaust system. Cold-air intake package and some aftermarket throttle bodies. It features NASA grade calibrations for upgraded performance and easy to use buttons and menus. The tuner is internet updatable and also features a real-time vehicle sensor display. It is also engineered with an electronically correct speedometer and transmission shifting suitable for wheels, non-stock tires, and rear end gear swaps. The tuner allows you to adjust the sped, shift points and rev limiter. The Superchip 3885 Flashpaq is an affordable tuner which offers the same performance capabilities as other tuners. You will experience improved throttle response, incredible power gains, and high-end drivability the first time you use this beauty. Though it may not come with a large resolution screen, the device is easy to use, and the manual instructions are easy to follow for those who are not tuner savvy. Product by Magnum Tuning. A company based in Orlando Florida that manufacturers first-rate performance parts for trucks, cars, Jet skis, Bikes, ATV, snowmobiles, and boats. The Smart-Tune is a product meant to bypass all the factory setting made by the manufacturer for your vehicle. First, it remaps the lean stock fuel maps to trick the engine sensor signal that’s read by the ECU into adjusting the fuel curve which in turn causes a 27% increase in horsepower as well as improvement of the acceleration. The domino reaction also leads to a smoother throttle response cutting across the entire RPM range. The advanced fuel programming by the Smart-Tune will bring out your engine’s full potential. The Smart-Tuner is also specially engineered to increase your fuel economy by setting up a more precise fuel setting calibration. It does so by connecting to your electronic engine management via the engine sensors. The Smart-Tune–X Semi Heavy Duty Performance Chip is what you need if you want to change your engine from stock settings to a custom tuned. You will get to realize your engine’s true horsepower all thanks to a simple device. The upgrades don’t even affect the engine’s lifespan or reliability. What’s the best tuner for 6.7 Cummins? How can I improve my diesel engine performance? What does a diesel programmer do? How does a tuner work on a diesel? What is the difference between a programmer and a tuner? Do performance chips void the warranty? 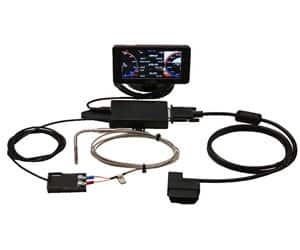 From our list, RaceMe Ultra Programmer with EGT Probe Pyro Kit is the best tuner for 6.7 Cummins so far. It boasts of a multiple gauge screen display and one tap features that make it both convenient to use and reliable. The fact that it has an expandable memory with a Micro SD slot places it at a step above other tuners. Regular upgrades on the engine components like installing a cold air intake system may improve your engine’s performance. Alternatively, you could get the Smart-Tune-X Semi Heavy Duty Performance Chip that improves that makes your engine customizable and makes a significant improvement to the horsepower and torque. A diesel programmer improves fuel economy and optimizes engine performance (improved HP and torque) on diesel trucks. A tuner modifies the characteristics of a diesel engine. The modified features include the fueling characteristics, operating parameters, primarily timing and power output. A programmer is the same as a Tuner. 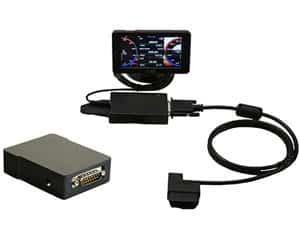 It’s installed to the OBD-II Port and enable you to customize your vehicle’s tunings depending on your preference. 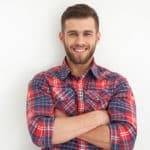 Your car dealer cannot void a warranty if there is no direct connection to show that the chip caused the damage to your vehicle. Generally, vehicle manufacturers do not void warranties due to aftermarket accessories. Our list entails high-performance tuners that do not compromise on the user experience. They also come with customizable displays and backgrounds to make your life easier. The fact that reputable companies make them means they are high-quality products guaranteed to make you happy.